Early years are a critical time for learning and social development. For infants, we focus on fusing learning with playtime with the help of stacking toys, hand puppets, and wooden toys. 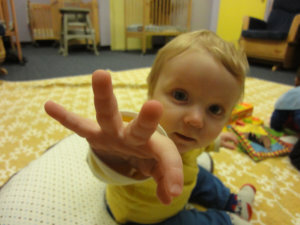 Since infants come into the world with different temperaments and styles of adjusting, patience and flexibility are essential qualities for the Center’s caregivers. The staff tunes into and learns about each infant’s unique qualities, while daily care situations and routines are turned into prime opportunities for learning experiences. Care of infants is individualized to provide a consistency between home and the childcare center. Please note that, in order to practice continuity, a teacher will move on with the children until they reach the three-year-old classroom.